Green beans might be my favorite vegetable. I know, it's not very exciting, but they're so good. Green beans have been a staple at my house since I was a kid. In fact, it was probably the first vegetable I learned how to cook. I can remember helping my mom snap off the ends of the beans. It was a very important job,or at least, mom made me feel like it was. 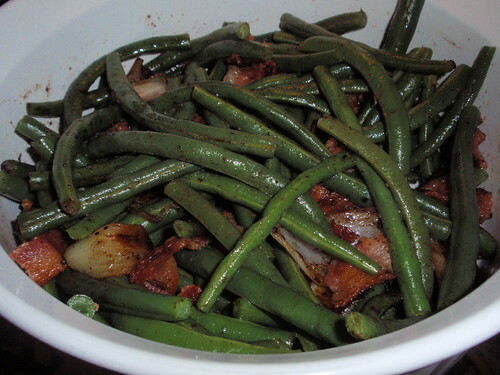 This recipe combines green beans, sweet onions, and smoky bacon for the perfect comfort dish. Snap or cut off ends of green beans. Bring large pot of water to boil. When the water is at a rolling boil, add the beans. Boil uncovered for 3-5 minutes. Taste test for doneness. The beans are done when they are cooked all the way through, but still have a slight crunch. Drain water out of pot, and add cold water into pan until the beans are covered. Drain again, and transfer beans to an ice bath. The faster you chill the beans, the greener and crisper they will remain. Meanwhile, fry the bacon in a frying pan. Transfer cooked bacon to a plate. Discard almost all of the bacon grease. Leave just enough to coat the bottom of the pan. Add chopped onion to frying pan and saute until tender. Add green beans to frying pan. Crumble bacon into pan, and toss. Remove from heat and serve immediately. Grease a 9x9 inch pan with baking spray. Preheat oven to 350F. For blondie base, melt white chocolate and butter together in a small saucepan over low heat, stirring frequently. White chocolate does not melt as smooth and pretty as dark or milk chocolate. Set aside to cool. Using a stand mixer, beat together sugar, eggs, and vanilla until smooth on medium speed. Add the cooled chocolate mixture and continue to beat until well-combined. Add flour and salt to batter, and mix on low speed until combined. Spread batter evenly in the prepared pan. Sprinkle white chocolate chips evenly over the top of the blondie batter. Set aside. For the pumpkin top, using a stand mixer, beat together the butter and sugar on medium high speed until light and fluffy, about 3 minutes. Add eggs and vanilla and continue beating until well-combined. Add the pumpkin and beat until thoroughly combined. Add the flour, baking powder, salt, and spiced to the pumpkin mixture, mixing until well-combined. 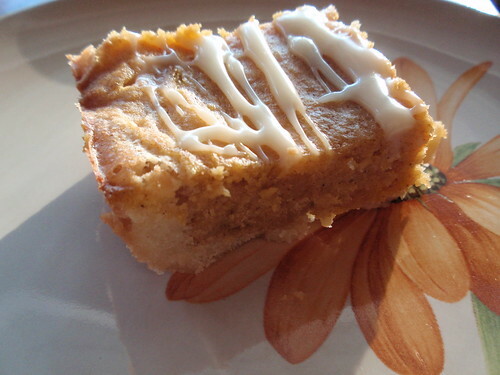 Pour pumpkin top evenly (do the best you can) over the blondie layer in the prepared pan. Bake for 30-34 minutes or until a toothpick inserted in the center comes out clean or with only crumbs, not batter, on it. Remove from oven and cool on rack for 1 hour. Drizzle melted white chocolate on top. I'm always on a quest to find the next football food for our Saturday game-watching get-togethers. If you've tried the Buffalo Chicken Dip, then you know, I'm looking for delicious, indulgent recipes to enjoy while we cheer on the Tide. This Hot Bacon Dip definitely meets this criteria. It's a nice change from the spicy flavor of queso and buffalo dip. As usual, this dip is great with Fritos or Ritz crackers. Preheat oven to 350. Slice quarter top of round loaf off, and set aside. 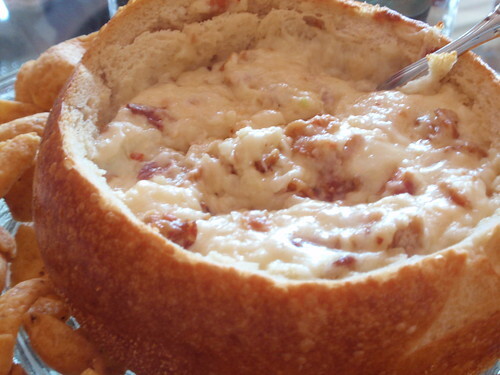 Carefully hollow out the inside of the bread bowl, leaving a one inch shell. Cube the bread and reserve to serve with the dip. 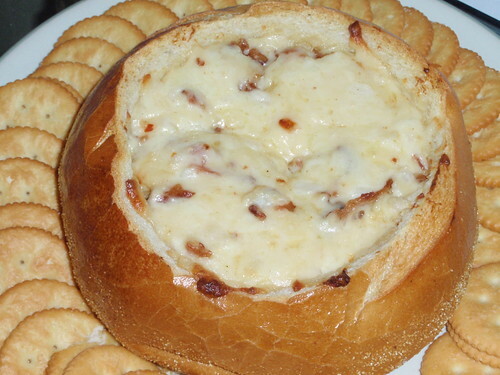 Combine remaining ingredients in a large bowl, spoon into bread bowl. Place on ungreased baking sheet, and cover with reserved quarter top of round loaf to prevent the dip from becoming too brown while baking. Bake for 45 minutes, or until heated through. Serve with bread cubes, crackers, or Fritos (my personal preference). 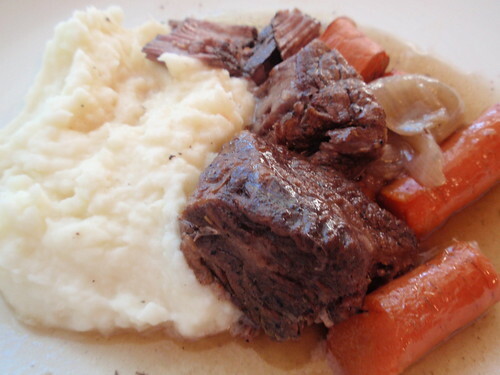 I've always made pot roast in a crock pot. It's delicious prepared in a slow cooker, but this weekend I wanted roast and carrots and found myself without a slow cooker. Cooking a roast in the oven is much easier than I expected, and I really love Pioneer Woman's recipe listed below. I especially enjoyed the carrots. I didn't peel them; I just cut them into large chunks and dropped them into the pot. Also, a note to all of you who don't care for onions - don't skip the onions in this recipe. They're vital to the flavor! Generously salt and pepper the chuck roast. Heat a large pot or Dutch oven over medium-high heat. Then add 2 to 3 tablespoons of olive oil. Cut onions in half (I cut mine into wedges). Cut carrots into 2-inch slices (you can peel them, but you don't have to). When the oil in the post is very hot (but not smoking), add in the onions, browning them on all sides. Remove the onions to a plate. If needed, add a bit more olive oil to the very hot pan. Place the meat in the pan and sear for about a minute on all sides until it is nice and brown all over. Remove the roast to a plate. With the burner still on high, use either red wine or beef broth (about 1 cup) to deglaze the pan, scraping the bottom with a whisk. When the bottom of the pan is sufficiently deglazed, place the roast back into the pand and add enough beef stock to cover the meat halfway (about 2-3 cups). Add in the onions and carrots, as well as the rosemary and thyme. Put the lid on, then roast in a 275F oven for 4 hours. We have finally had our first cold snap of the season! I love cold weather, or rather, I love the changing of seasons. (I love hot weather when it's been cold for months.) Cold weather means knee high boots, turtlenecks, chunky sweaters, hot chocolate, and soup. I love soup, but it's not something I make at home very often because JB is so picky. 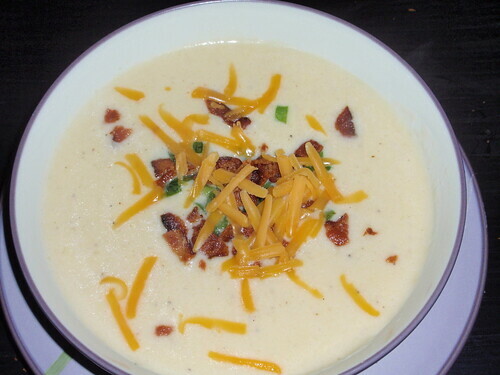 I've bookmarked a lot of soup recipes over the last few months, but I knew I finally found one he would like when I came across this Baked Potato Soup. This recipe is a little different than most that I've found, because it calls for the potatoes to be baked instead of boiled. The creamy potato broth with the addition of cheese, bacon, and sour cream makes for the perfect combination. It was definitely a big hit with JB. In a large stockpot or Dutch oven, melt the butter. Add 1/4 cup of flour to the pot and whisk into the butter. Cook, whisking constantly, until golden brown, about 2 minutes. Whisk in the milk and the rest of the flour. Cook until thick and bubbling, about 6-8 minutes. Mix in the potato chunks. Whisk in the salt, pepper, and cheddar cheese and stir until the cheese is melted. Remove from the heat, stir in the green onions and sour cream. Wash and dry apples. 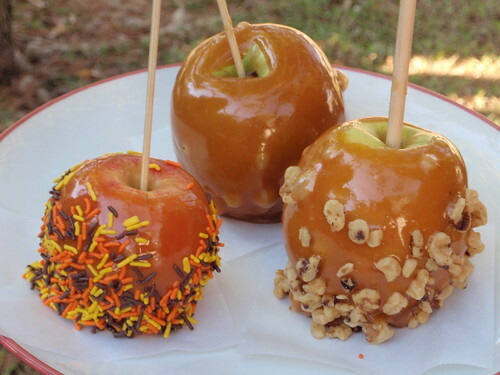 It's important that the apples are completely dry, or the caramel will not stick to the apples. The apples should also be at room temperature. Place each topping on a small plate. Unwrap caramels and place them in a small saucepan. Add milk. Heat caramel on medium heat until completely melted and smooth. Dip apples in caramel and spin the apple as you pull it out of the pan. Roll apple in topping of choice. Set on wax paper while it dries. You can put the apples in the refrigerator once you've dipped them in the caramel to help them dry more quickly, but you should store them at room temperature. I love the changing of seasons for so many reasons. 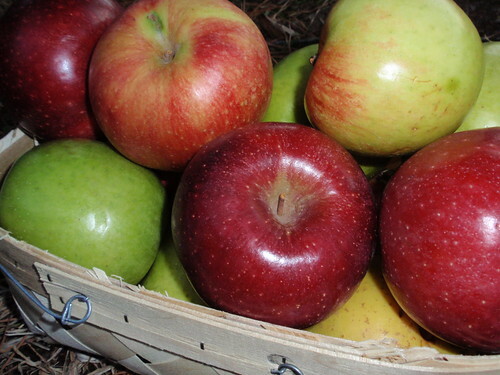 I love fall because it means fresh apples. I recently visited family in North Georgia and had an opportunity to pick up some fresh picked apples from a farmer's stand. I picked out an assortment of apples - gala, jonagold, rome, fuji. I was so excited about picking out apples, I probably ended up with 10 pounds! I wanted to be sure I had plenty of apples for all of the apple recipes I've collected. The first apple recipe I chose was an apple cake. This cake could, quite possibly, be the best cake I've ever made. Well, maybe not THE best. I sure do love the Apple Dapple Cake (look for that post next week) and the Banana Caramel Cake (another post to come soon). But it was really delicious. It's one of those made-a-cake-for-no-reason cakes. I particularly like this cake because it has dried dates and chopped walnuts in it. These ingredients could both be omitted, but I think they make this cake interesting. I tried a piece of this cake right after it came out of the oven, and it was delicious. The next morning it was even better! Preheat oven to 350. In medium bowl, sift together flour, baking soda, and cinnamon with a wire whisk and set aside. Combine sugar and oil using a mixer until blended. Add eggs and vanilla, mix until combined. Add flour mixture and mix well. Stir in nuts, dates, and apples. The batter will be very thick. Pour into a greased and floured 9x13 pan and bake for 40-45 minutes or until done. Do you remember this nursery rhyme? 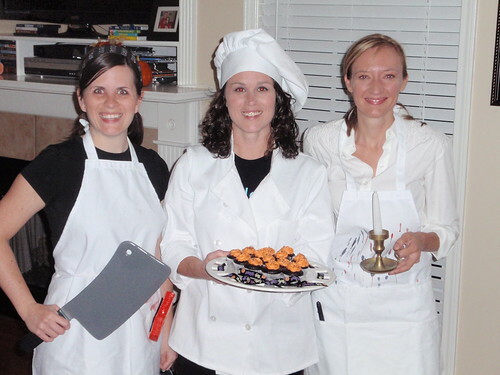 For Halloween 2010, my friends and I dressed up as The Butcher, The Baker, The Candlestick Maker, and Yours Truly went as The Baker. I was so excited to have an excuse to wear one of those floppy baker hats! 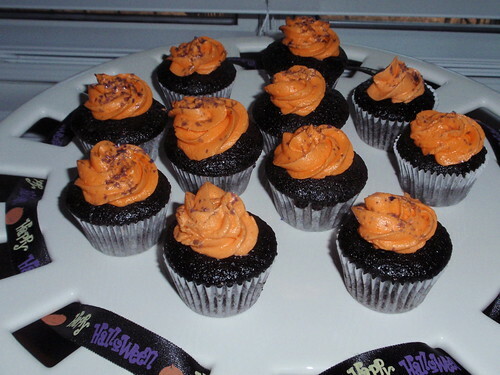 Of course, every good baker (real or not) must have yummy treats for people to sample. I made mini chocolate cupcakes with vanilla buttercream frosting. Preheat oven to 350. Line muffin tins with paper liners; set aside. Sift together cocoa powder, flour, sugar, baking soda, baking powder, and salt into a large bowl. Add eggs, warm water, buttermilk, oil, and vanilla, and mix until smooth, about 3 minutes. Divide batter evenly among muffin cups, filling each about 2/3 full. Bake until tops spring back when touched, about 20 minutes. Transfer to a wire rack; let cook completely. In a standing mixer fitted with a whisk, mix together sugar and butter. Mix on low speed until well blended and then increase speed to medium and beat for another 3 minutes. Add vanilla and cream and continue to beat on memdium speed for 1 minute more, adding more cream if needed for spreading consistency. 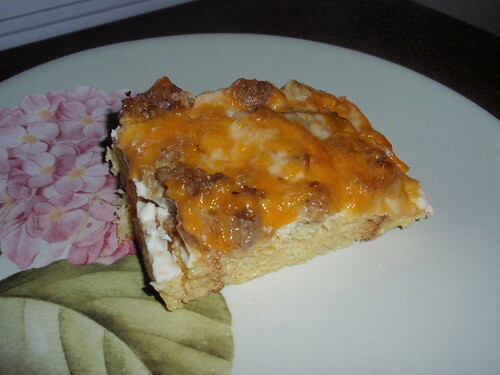 I love breakfast casserole, and this version is "Easy Like Sunday Morning". You could easily swap out ingredients and experiment with bacon, different types of cheese, or add chopped veggies. The possibilities are endless! 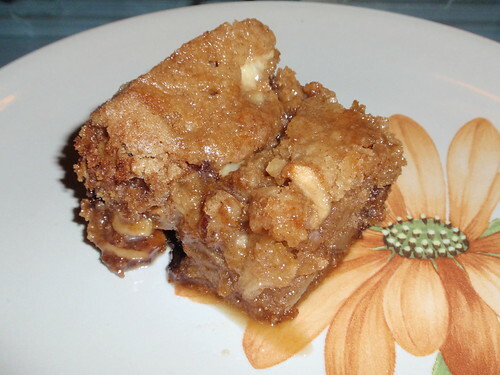 I kept this version simple for my house guests, but it was delicious. Preheat oven to 350 and grease baking pan. Place bread in pan and distribute evenly. Beat eggs, milk, and spices; pour over bread. Add remaining ingredients (sausage and cheese) and bake for 25 minutes or until top is golden brown. Let sit for 5 minutes before serving.